Having an inviting outdoor space to entertain or relax has become an important part of modern living. A well designed patio or deck area is a great addition to any home. It’s a surefire way to add value to your property and showcase your personal style at the same time. Like most things in our homes, it’s important that that space reflect our own taste and personality. The furniture you choose and the aesthetic you follow should be as unique as you are. Winter is the perfect time to start planning upgrades for the new year, so we’ve picked out some images of unique outdoor spaces to help get that inspiration flowing. 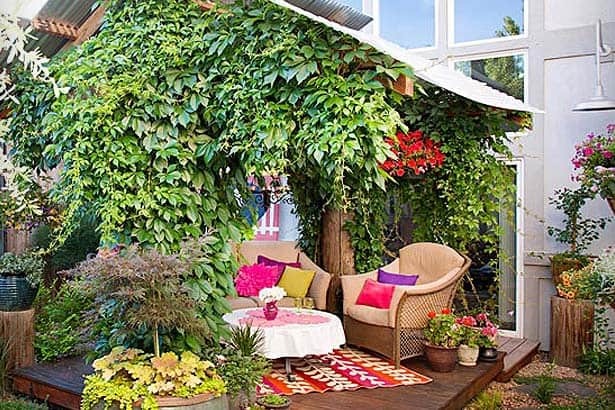 This beautiful mini-sanctuary reminds us of something out of the Secret Garden. Comforting as well as airy, this outdoor room features classic French doors, suspended divided-light windows, and a corrugated-metal roof. The construction creates the impression of a fully enclosed space, while the bed provides a cozy spot to sit and read on a summer day. At night a space like this could transform into a beacon of light illuminating from within and scattered landscape lights surrounding its exterior. The clean and contemporary design of this deck and pool area is highlighted by the stylish outdoor lighting scheme. Combined with modern furniture and stone paving, the ambiance created is sophisticated but also inviting. It’s a prime example of how lighting and landscaping can work together to create a beautiful space. For bonus points, notice the bridge that takes you to an island with a fire pit. 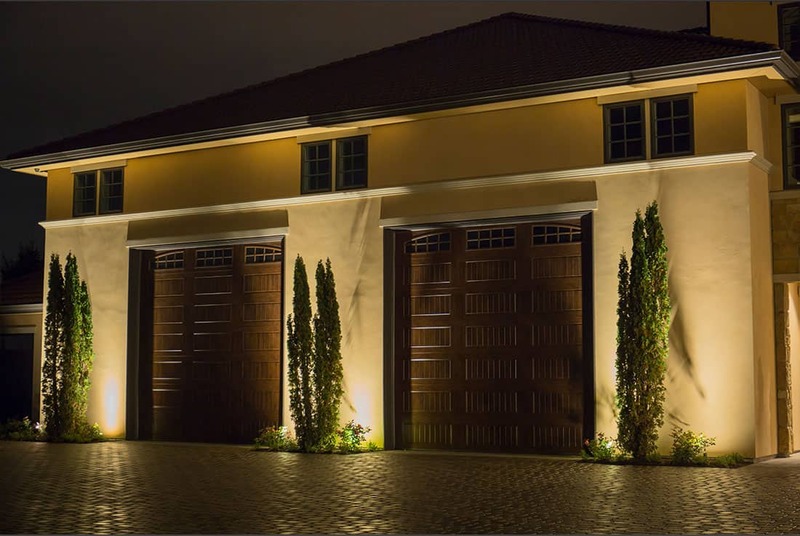 Just make sure if you emulate this design to keep it well lit with light fixtures along the walkway. 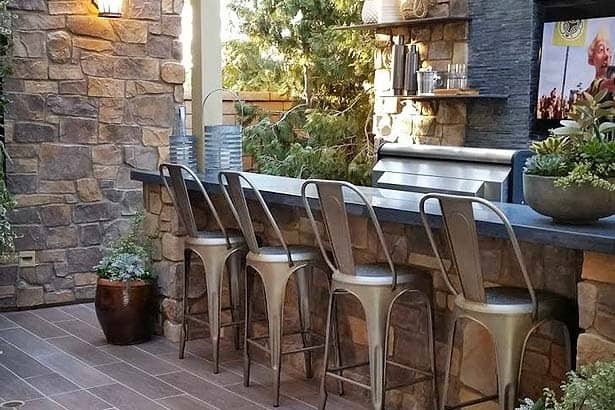 Outdoor bars are one of the most popular outdoor living space additions made to modern homes in America. In this space, the contrast of the brushed metal furniture and exposed stone create an elegant modern rustic aesthetic. The soft lighting of the lanterns also provides a cozy, intimate ambiance, making this area perfect for outdoor entertaining on both a formal and informal level. If you don’t have a lot of room to play with, dress up a basic deck with simple additions like plants and colorful furniture. By draping the rustic wooden pillars with lush greenery and adding a modern metal roof, this humble living area is absolutely transformed. The bright and cheerful furniture also adds a touch of quirky personality to the space. Don’t be afraid to play with color. This space is a prime example of using your environment as inspiration. 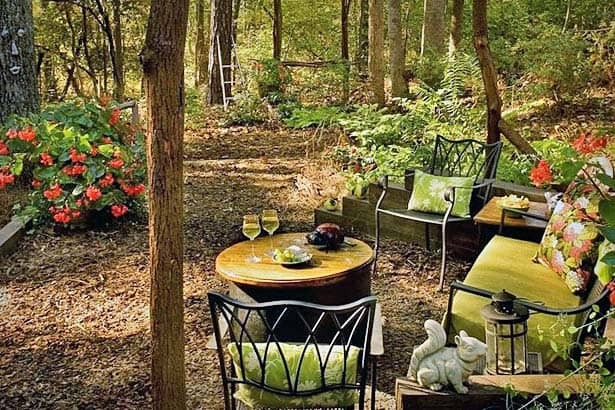 Of course, not everybody has a gorgeous forest in their backyard but elements of this rustic woodland patio can be easily recreated with a little DIY know how. 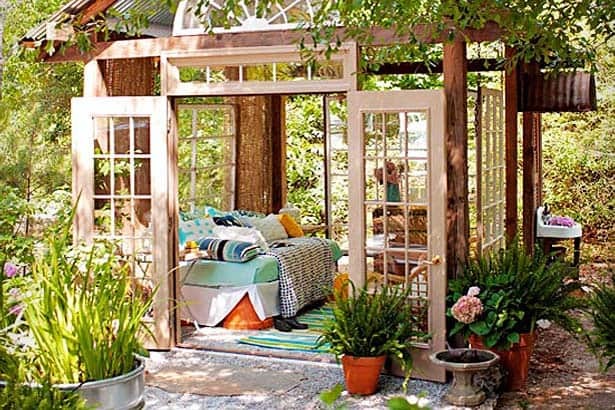 Create an elegant pergola out of reclaimed or found wood, furnish the area with cozy vintage inspired patio furniture and decorate the space with whimsical sculptures. 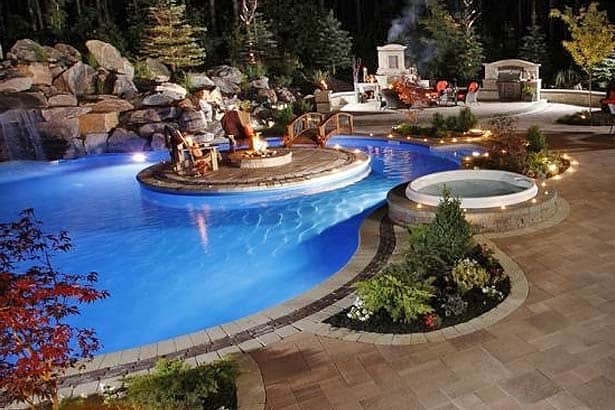 Hopefully these images have inspired you to create a unique outdoor living space of your own. Happy planning!